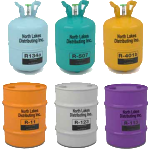 North American Refrigerants, Inc. is a nationwide provider of refrigerants. We buy recovered and surplus refrigerants, anywhere in the United States. We supply common to unusual ARI 700 standard refrigerants in single small containers to tanker quantities. All of our refrigerants including our own ARI 700 standard reclaimed, packaged and virgin refrigerants are warehoused in 3 locations across the US. We deliver to most locations in 1 – 3 business days. Quick turn-around time is what customers expect from NARI. © North American Refrigerants, Inc. All rights reserved.